The role of the family kitchen has changed over the years into more of a social gathering space rather than just a preparation space. Kitchen lighting needs to focus on layered lighting elements that provide you with an inviting ambience for your guests, and task lighting that’s important when preparing food. Layered elements should work together to achieve a cohesive environment that is functional and looks amazing! Focused task lighting can be achieved by hanging pendant lights over your kitchen island. This helps provide task lighting when needed. Undercabinet lights can also be utilized to provide light on counter tops and a soft ambient light that makes your kitchen look warm and inviting to guests. These pendant lights by Phillipe Starck provide task lighting over this island while blending in perfectly with the natural light that pours through this beautiful kitchen. People often make the mistake of placing a single light in the center of the room. This type of placement throws shadows on your work area because the lighting is directly behind you. Ambient lighting tends to be the most overlooked lighting strategy of most homes. Modern kitchens aren’t just used to prepare food… they tend to be the main social hub of your home. Floor plans are opening up to attract and draw people from your dining room to the kitchen. 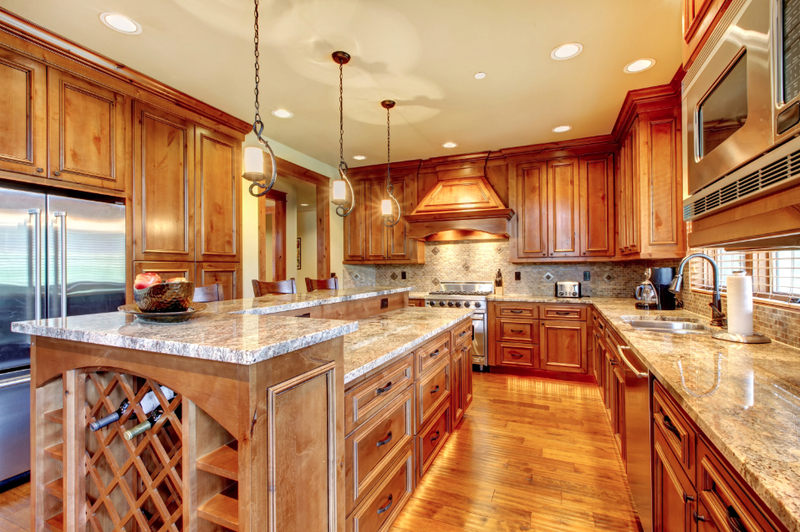 Ambient kitchen lighting provides a warm and welcoming vibe that makes people feel comfortable. Flush-mounted ceiling fixtures, track lighting and hanging pendants over your kitchen island will help you achieve a warm ambience that compliments your kitchen and welcomes your guests. Accent lighting has become popular with casual entertaining. Delicate china can be spotlighted with lighting placed inside glass cabinets. Artwork can be showcased with track lighting that illuminates wall paintings. Puck lights can be installed into deep cabinets with motion sensors that activate when opening or closing your cabinet doors. Fluorescent lighting provides direct task lighting under your shelves. Here’s a link to a great article in Better Homes and Gardens on under cabinet lighting tips and techniques. Read article here. 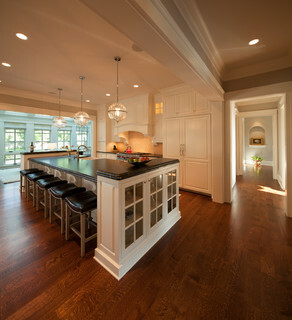 Windows and skylights provide an abundance of natural light for any sized kitchen. If your kitchen lacks natural light, you may want to consider brightening things up by painting your kitchen ceiling with a bright yellow tone. This helps hide the fact that your kitchen doesn’t receive natural sunlight. Layered lighting helps provide you with a beautiful end result that is esthetically pleasing and functional. If you liked this article, sign up here so you never miss useful home renovation tips from our home renovation team at Cast Sustainable Construction in Vancouver.